Some time ago I made a blog post about some puzzles I am going to include in the module. One of them involved runes: a fantasy element that lends itself to puzzles and magic. This time around, I have expanded on the idea that the PCs are required to seek and collect various runes that they will need to help with the "puzzle" itself. At this stage, the puzzle acts as a "lock" to whatever the PC is trying to gain access to. However, I have also added the idea that these same runes play another active role in rune magik, which the PCs can learn about in one of the adventures they have. 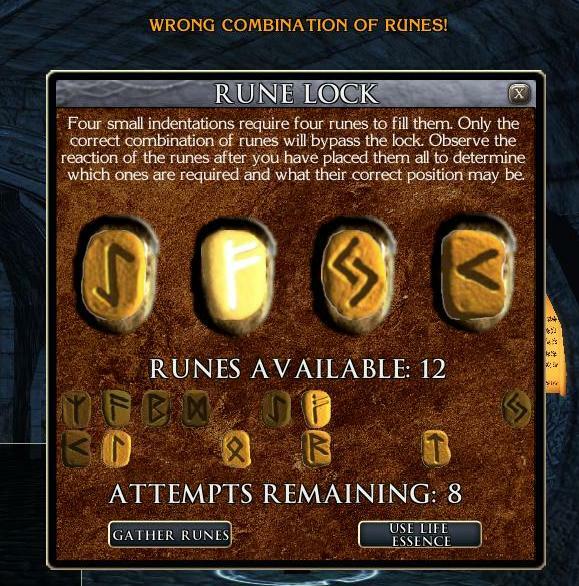 I won't go into detail of the latter, but here are some screen shots that give an idea of the former rune puzzle, which has a gaming element similar to the classic "Mastermind" puzzle. 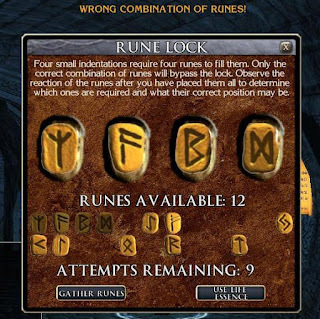 The PC encounter the "Rune Lock" puzzle and the game automatically presents all the runes that the party have acquired in their adventures to date. (Gaps are missing runes.) In this case, the heroes have found half of the 24 runes that are available. 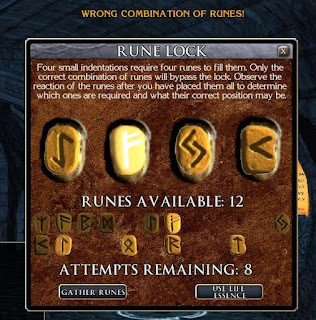 The player starts to enter possible combination of runes and observes the rune reactions. It looks like none of the first four runes tested are required for this lock! One attempt down! The player tests another set of runes from those they have available to them. Ah! A bright glowing rune that indicates it is correctly positioned. But now only eight attempts remain and the party only has 4 remaining runes to test. Do they have the runes they require? Unlikely! In this case, the chances are that the party have not yet even found all the runes they need to unlock this object. 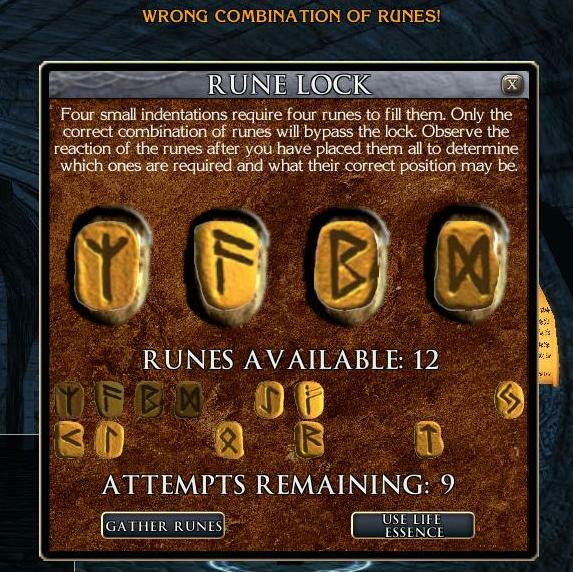 So, they must continue their search for runes to help them past this lock. If they fail to find the combination in the attempts remaining, then they can either expend a Life Essence to give themselves another attempt (one Life Essence per additional attempt) or wait a period of time for the lock to reset. 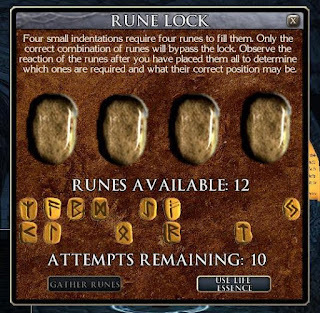 Most Rune Locks start with ten attempts, but it may be possible to find Rune Locks with less attempts available from the start. Along with designing more puzzles/mini-games, I have been continuing to work on conversations that join the areas and story together. As I have reported before, it is a slow process, but it is coming along. I would also like to take this opportunity to thank Eguintir of Eguintir Ecologies for helping me with the design of a couple of areas. As regular readers will know, I find designing and working with areas one of the hardest aspects of the game, and Ryan very kindly offered some of his time to take care of a couple of interior areas that were outstanding for this module. He has already returned one area, which is near completion, and I believe is hard at work on the second. His contribution is very much welcomed, and I hope players will appreciate his work in this module as much as they may have in his own modules. This looks awesome, man - mini games really add a lot of extra value. Especially where the player picks up the pieces along their journey. Neat stuff! Thanks! :) I like this kind of mini-game in my modules too. It adds an "immediate" requirement feel and a level of progression that I like. Also it is good to hear you are still visiting. It's not easy to tell who is still keeping up, and the odd post from people is great encouragement.